One of my favorite things about cooking in Hawaii is the fish. Being on an island, I have access to good quality freshly caught fish at reasonable prices. Two of my current favorites are ahi (tuna, of various kinds) and opah (moon fish). Yesterday I picked up an ahi steak at the fish market. I marinated it in a shoyu mustard sauce before searing it for dinner last night. Accompanied with some rice and steamed veggies, I made a fresh and simple dinner of half the steak. But where this piece of fish really shone was for lunch in a salad. To make the dressing, add all ingredients but olive oil and pepper to a small bowl. Whisk to combine. While whisking, add the oil to the dressing. (I tend to like my salad dressings more acidic than a lot of people, so feel free to add more oil to suit your own taste.) When your dressing has reach an emulsification, add a few generous grinds of fresh pepper to taste. To assemble the salad (do you really need directions for this? ): Wash, dry, and tear the salad greens into bite-sized pieces and arrange in the bottom of your salad plate. Slice the cucumber and tomato and add to the salad. Arrange the slices of fish over the greens, drizzle with the dressing, and top with scallions. Now, doesn’t that look good? If I didn’t need to keep working, a glass of nice white wine would have been great with this lunch! Or, you could make it for dinner, open a bottle of wine and enjoy. Maybe have something decadent for dessert since you were good and had a salad for dinner. Crème brûlée, anyone? 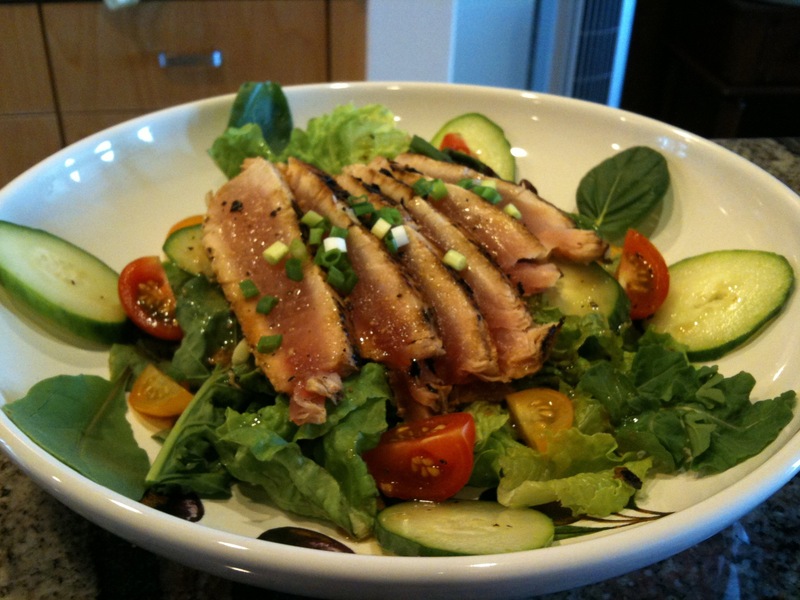 This entry was posted in Fish & Seafood, Vegetables and tagged ahi, fish, salad. Bookmark the permalink.